What’s the ROI of a digital marketing campaign? How to measure it? How to learn from your own or your competitors’ results? Let’s learn from this week’s expert! 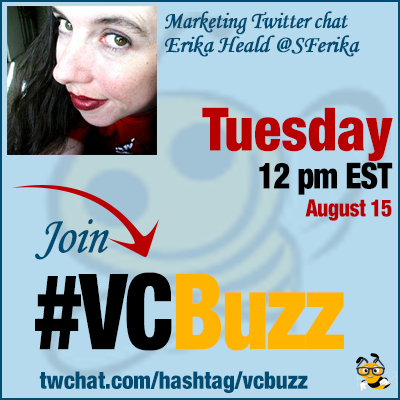 Erika Heald @SFerika implements content strategy and processes that drive lead generation and customer loyalty by creating compelling, shareable, targeted content. I was fresh out of college, with a journalism degree. I’d been freelancing for a small, niche publication. I loved what I was writing about, and wanted to be able to share it more easily with others. So, in my spare time, I built them a very basic website. In turn, they gave me the title of Online Editor. After that, all my marketing roles had a digital component, along with content. Which is a good thing! Q2 What types of results should (and can) digital marketers focus on? How to measure them? It’s easy to get hung up on vanity metrics since they are so easy to obtain. This is especially true w/out defined objectives. You need to identify KPIs and metrics that ladder up to what you are trying to accomplish with each activity. If you want to keep your budget, you’ve got to be able to tie your activities to closed deals or sales. Also important to build and maintain an engaged subscriber list/community. For example, for an awareness objective, you’d be looking at social sharing of content, increased brand mentions. I personally am always looking to see how programs+activities ultimately influence sales. Even if you don’t have great attribution systems in place, you can use UTMs to ensure you get credit for sales. A large following without engagement isn’t influence, yet so many people chase after follower count. Which is why it’s terrible that so few folks have documented content strategies, including those objectives. Q3 What’s your favorite lead generation tactic? My favorite lead generation tactic is leveraging a big rock piece of content and up cycling it into numerous other items. For example, an e-book can become blog posts, a webinar, an online course, a SlideShare, and an infographic. Each component explores a slightly different angle, and reaches those who prefer that content type. And a topic that’s rich enough to generate all this is one that’s likely to be of value to your audience. Q4 What’s the future? Where is social media marketing heading? The future of social media is personalized. Personalized video, content, and social interactions. AI and big data-fueled insights allow you to have social conversations that reflect your past interactions. And as @joshmccormack noted, conversations are where it’s at. Have to use social for more than pushing your own content. Q5 What are your favorite lead optimization tools? I couldn’t do my job without @Buzzsumo. It helps me understand the topics people are talking about + who’s talking. Google Analytics and Google Adwords keyword planner are also must-have tools for lead optimization. I’m also a fan of using the @Moz keyword explorer and @answerthepublic to ID the right topics to cover. I use UTMs + @bitly to measure what content+channels are driving results. It’s an easy, free way to measure your ROI.